Few things have captured the American imagination as much as the Wild West. A fixture of American pop culture, the Western genre had its earliest milestones in the first years of the 20th century with the publication of Owen Wister’s novel The Virginian in 1902 and the debut of the film The Great Train Robbery in 1903. The latter was one of the earliest movie blockbusters and set the tone for the enormous success of the Western genre in Hollywood throughout the century. Radio westerns appeared in the 1930s with early examples including The Lone Ranger of 1933 and The Cisco Kid of 1942. The year this paper was manufactured, 1949, The Lone Ranger and Hopalong Cassidy debuted as the first TV westerns. Over the next ten years over 80 tv westerns would debut on network television including The Roy Rogers Show, Gunsmoke, Zorro, and Bonanza. For a young boy of the 40s and 50s, whose room a high-energy paper like this was probably meant to decorate, there would have been few images as appealing and ubiquitous as the cowboy, the gunslinger, or the bandit. 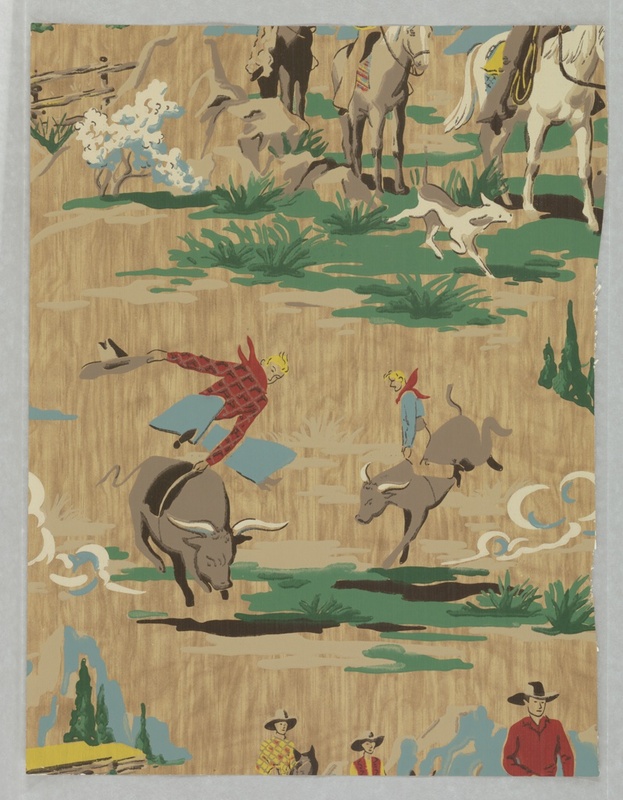 This paper depicts scenes of cowboys competing in a rodeo and riding across the range. With its bright colors, wood grain background, and sketchy line work, the paper exudes a sense of roughness perfect for its subject matter. The paper was manufactured by Devoe and Raynolds, Inc., a New York- and Chicago-based company that primarily manufactured paint. The company was incredibly long-lived, starting at first as a company founded by William Post in New York in 1754. Charles Raynolds became a partner of the company in 1848, and Frederick Devoe joined the firm as a partner in 1852. The company eventually moved its manufacturing center to a building built on Halsted Street in Chicago in 1902. Throughout its history, it remained relatively successful, though this foray into wallpaper production seems to have been short-lived. In 1964, after over two hundred years of operation, the company was bought by the Celanese Corporation. The Cooper Hewitt has 17 examples of Devoe and Raynolds wallpapers, all from the same year and purchased not long after they were produced.